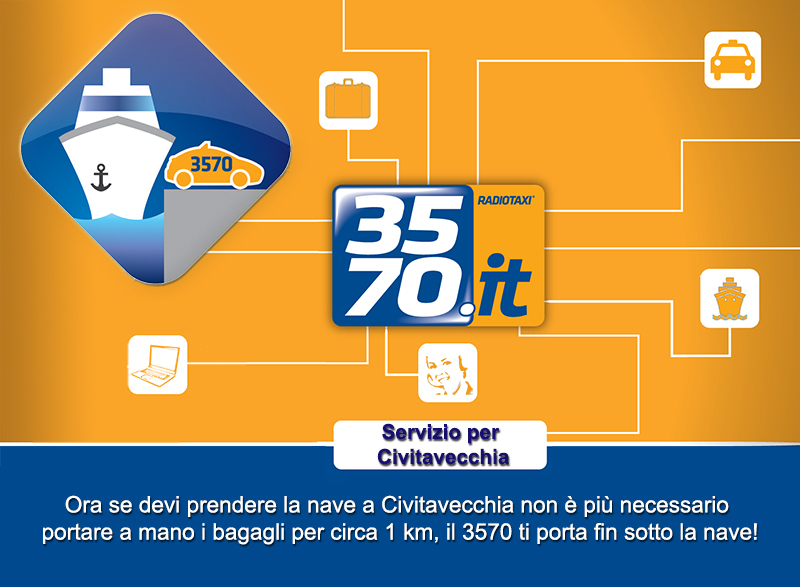 Who goes on a vacation starting from Civitavecchia's Harbor is, due to security concerns, required to get off their car at almost 1 km of distance from the quay and to carry their baggage by hand all the way to the ship. Various 3570 drivers have undergone specific training and obtained qualification and authorization from the Port Authority to carry passengers (and their baggage!) right under the loading area of the ships. A unique and convenient service that Cooperativa Radiotaxi 3570 provides to its clients. How does one request the Civitavecchia service? It's sufficient to request a taxi with one of the available systems, specifying that the destination is Civitavecchia's Harbor. How much more does the service cost? The new service does not incur any additional costs for the client, the amount to be paid to the driver is that provided for by the fees of the Capital Rome City Council.